(Nanowerk News) For the first time a team of researchers have discovered two different phases of magnetic skyrmions in a single material. Physicists of the Technical Universities of Munich and Dresden and the University of Cologne can now better study and understand the properties of these magnetic structures, which are important for both basic research and applications. Whirlpools are an everyday experience in a bath tub: When the water is drained a circular vortex is formed. Typically, such whirls are rather stable. Similar structures can be observed in magnetic materials. Magnetic whirls are formed when the magnetic moments are aligned in a circular fashion. These so-called skyrmions are not just interesting for basic research -- because of their stability and their tiny dimensions they could prove crucial for the development of future magnetic storage. For these reasons they are currently at the center of a large body of research. One of the key questions is about when and how they occur. A team of researchers from Technical University of Munich (TUM), Technical University of Dresden and the University of Cologne has shown for the first time, that magnetic skyrmions can form due to different mechanisms in separate phases in the same material. Their discovery in the chiral magnet Cu2OSeO3 near absolute zero temperature (-273.15°C) is published in the scientific journal Nature Physics ("Observation of two independent skyrmion phases in a chiral magnetic material"). Tiny magnetic structures for compact magnetic storage? "Skyrmions usually exist in a single thermodynamic parameter range, that is, a certain range of temperature and magnetic or electric field strength. Indeed, this is the case for all the materials in which skyrmions have been found so far," explains physicist Christian Pfleiderer of TUM, who led this research study. "This imposes a constraint for the creation and technical use of skyrmions, since they are only stable as long as one finds and abides to the exact physical parameters required. Now, in a single material we have found two different skyrmion phases, with two different sets of parameters. Previously it was thought that the new mechanism is very weak. But now it turns out, that there are many more possibilities to create and control skyrmions than we have thought." Alfonso Chacon discovered the new phase, when he studied the metastable properties of an already known skyrmion phase at the research neutron source of TUM. He explains: "These metastable properties interests us, because this way we can learn about the related energies and the stability of skyrmions. This helps us to understand the mechanism of their formation and how they are destroyed. While we performed these measurements I discovered that something very unexpected and odd was going on." "At low temperatures quantum effects play an increasingly larger role", explains Dr. Markus Garst from the Institute of Theoretical Physics at the Technical University of Dresden. "These influence also the physical properties of the magnetic skyrmions. 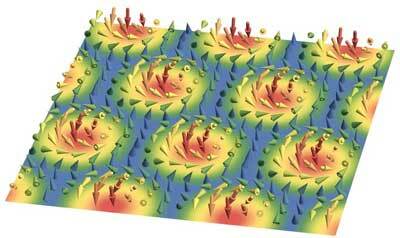 The new findings allow to study quantum skyrmions in magnets in detail." "We have been working on skyrmions for more than a decade and for one and a half years at the current project and have a very successful collaboration among the groups," says Markus Garst. "The colleagues from Munich made their observations with neutron scattering experiments, that allow to visualize magnetic structures. In collaboration with Lukas Heinen and Achim Rosch from Cologne we were able to explain the experimental results." This scientific discovery was only possible, because of the close collaboration between both experimental and theoretical physicists.